A root canal is a treatment to repair and save a badly damaged or infected tooth rather than having to removing it. 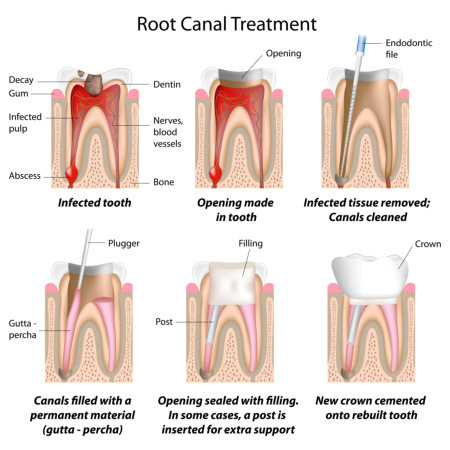 The term “root canal” refers to the cleaning of the canals inside a tooth’s root. Decades ago, root canal treatments were slow and often painful. With dental advances and modern anesthetics, most people have little, if any discomfort. In fact, it is usually much more painful living with a decayed tooth. Alternatives to a root canal include extracting the damaged tooth and replacing it with a dental implant, bridge, or removable, partial denture. While all of the general dentists at Dental Arts are skilled at performing root canals, most patients in our practice are treated by our root canal specialist (endodontist), Dr. Alan Tang. As a specialist in this procedure, Dr. Tang can skillfully manage or prevent severe tooth infections and render patients comfortable almost immediately. With his years of experience and the high volume of root canals that he performs on a regular basis, he can complete most root canals very quickly. Within the center of each tooth is a living core called the pulp. Nerves and blood vessels run through canals in the roots of each tooth and into the pulp. If a tooth is badly cracked or has decay that has entered the pulp, bacteria can get in and cause infection (an abscess). This can cause swelling and pain. Once it is determined that a root canal is necessary, a local anesthetic is given. Then a rubber-like sheet, called a dental dam, is placed on your tooth to isolate and shield it from saliva and germs. The decay is then removed and a small opening is made into the pulp. Using sensitive rotary instruments, the pulp chamber and canal are flushed and cleaned, and the living tissue (nerves and capillaries) are removed. The canals are then widened, disinfected and dried. A sealant is used to fill the canals to prevent further germs from ever re-infecting the tooth. Then, the tooth is closed with temporary filling material. Because there are no longer any nerves remaining in the tooth, any pain that you may have experienced before the procedure will quickly subside. The final stage of the root canal is restoring the tooth. The decay or fracture that may have necessitated the root canal often leaves too little tooth structure remaining to place a traditional filling. Additionally, without a pulp or blood supply, the remaining tooth will be become more brittle with time. A full-coverage crown is usually the best restoration to protect the underlying tooth. Often a titanium, gold or carbon-fiber post will first be placed in the canal to provide the additional strength needed to withstand many years of chewing ahead.